When I organized all my jewelry, makeup, etc. in my new dressing table last weekend, I got inspired to do some reorganizing in bathroom as well. This space has haunted me since the day we moved in. It’s tiny, completely devoid of concealed storage, and painted my least favorite color. I have never photographed it for the blog. And it was so depressing before I got started cleaning it up last weekend that I couldn’t even bring myself to take a “before” picture. But just so you can get a glimpse of how crowded and cluttered it’s been for the last few years, I grabbed these screenshots from when I took a quick peek into it during this house tour video over a year ago. With so much of what I needed stored moved to the dressing table in my bedroom, I was able to get rid of the cheap bookcase that crowded the doorway. I kept the big basket on the floor for bath towels. 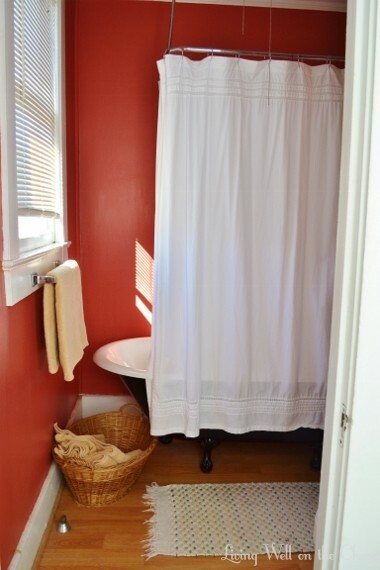 Now the focus is on the only thing I actually like about this room–the clawfoot tub. I actually tried to get Nick to take out that long white shelf, but one of the screws mounting it to the wall was in really tight and wouldn’t budge, so I decided to work with it. I’m glad I did, because I like the way it looks now. The wall above it used to have a bulletin board with all my jewelry hanging from pushpins, but with the space newly freed up I hung this white shelf I already had. After some ruthless decluttering I managed to fit everything in need of concealed storage into those two baskets and the medicine cabinet. Holla. Then I went hunting the house for cute stuff that could add function, like a mason jar full of q-tips, a floral print in a simple frame, a pretty glass for bedtime sips of water, a vintage dish for some lavender soap I’ve been meaning to put out, and a mercury glass votive candle. There’s a small silver dish on the left for hairties and bobby pins to put my hair up when washing my face or taking a bath. The only ugly things that got to remain in plain sight were my blow dryer and hair brush, because I am just too lazy to unwrap the cord and plug it in then wrap it back up and put it away every time I wash my hair. You’d think since I only wash my hair two or three times a week it wouldn’t be a big deal, but apparently that’s where I draw the line. The bathroom is right at the top of the stairs, and basically the entire second floor is our bedroom. It’s open to the stairs for kind of a loft-like effect. I’ve had this little table at the top of the stairs for months and have always thought that I should find something useful to store in the little drawer and on the shelf below. Finally I got the idea to keep a few cleaning supplies in the drawer–some glass wipes, a seen-better-days magic eraser, and a pumice stone. The shelf is still empty. What I really want, in my heart of hearts, is to paint this room. Red is just not my color. I’ve thought about painting it green, pale gray, or even plain white–a part of me thinks that the lighter the color, the bigger the room will feel, and since the trim, fixtures, and shelves are white maybe it would be fun to have it all white with just the pop of black on the tub and some natural colors/textures in the baskets and towels. Or maybe that would be too much white. Maybe gray would be better. I’d also love to replace the floors someday. Since it’s such a small space I could go with something a little extravagant, like pretty marble hex tiles. But I’m pretty sure tiling under a clawfoot is a job best left to professionals and besides, the blond laminate in there now is such a strange choice that I wonder if there’s something going on that I don’t know about–like a weird subsurface or an older tile floor in really poor condition underneath. That’s all filed under “maybe someday” anyway, since our budget does not exactly allow for new flooring at the moment. But paint! Now there’s something I can afford. I’ll get to it right after the laundry room I’ve been meaning to paint for six months, haha. I was just thinking about those cheap white frames from target yesterday, and how I forgot to include them in my frame wall. But I had forgotten I gave you those flower pictures! I was like, OMG I have pictures just like that one. Lol yes this is the first time I’ve used any of them! That frame is actually from Ikea circa 2008 or so–probably the first time I ever went! 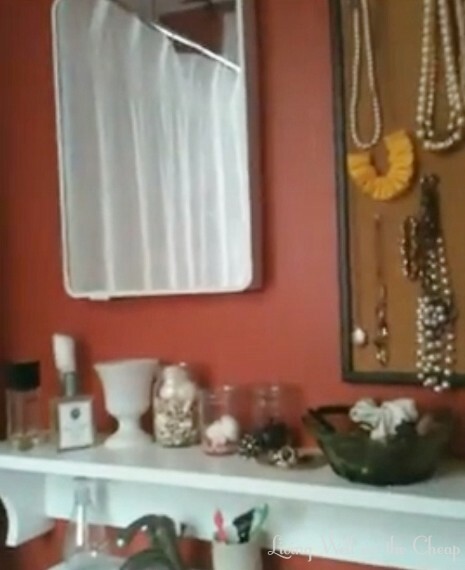 Where did you get the 4 compartment shelf that is above the toilet? I love it! Thanks Renee! A friend actually gave it to me when she was moving and didn’t want it anymore. I’m not sure she even knew where it came from!